Cameron Meredith's injury puts a somber end to week three. Ryan McDowell asked the Twitter-verse what they thought of QBs based on their ADP. The Redskins start the rebuilding process by adding Terrelle Pryor. Pierre Garcon is set to sign with the 49ers. We examine the aftermath. We cover the hot topics to keep tabs on over the summer for each team in the NFC East and North. 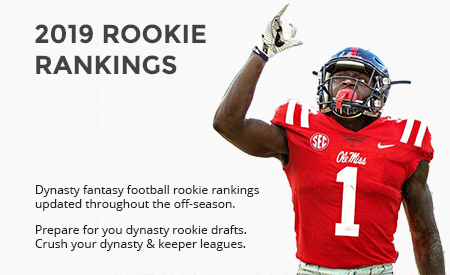 So you want to rebuild via the NFL Rookie Draft? Let's go down the rabbit-hole Alice! We round up the magic, mayhem, and mishaps from another manic week of football. We recap all of the action from a crucial week 11 slate. We cover this week's hot topics. The dynasty season in review for Washington.